Anyone else planning a vacation to one of the Disney theme parks soon – or just starting to think about going in a year or two? We did this before our last trip and got this FREE Disney Planning video. It got the whole family even more excited about our upcoming trip that next month – the kids watched it multiple times so they knew what to expect. 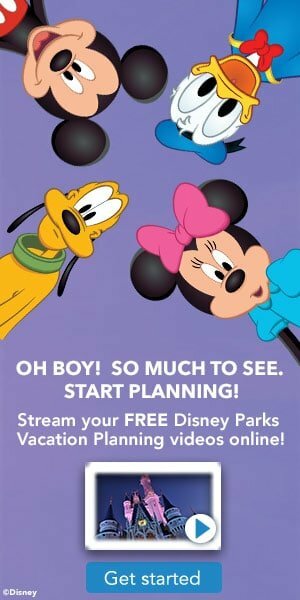 All you need to do is click the image above & it will take you to the site to enter your information to get your Disney Planning guide sent to you for free. It takes you directly to the Disney site, or you can click this link here to access the free Disney video request form. This may also a great way to get on their mailing list so you are notified of special promotions. I think this is how we got on the list (no one seems to know for certain, but I have been requesting these fore each of our trips, and I get mailers from Disney yearly with special promo codes (like 30% off promo code this year) that we were able to use to get great deals on the Disney Resort Hotels). Hotels and Disneyland – Ways to Save the Most on your Stay! Plus, be sure to check out our Disneyland Deals page for more tips on saving on a Disneyland vacation! Please do a post after you go! We have a family of 6 and NEED frugal!